AT0001. 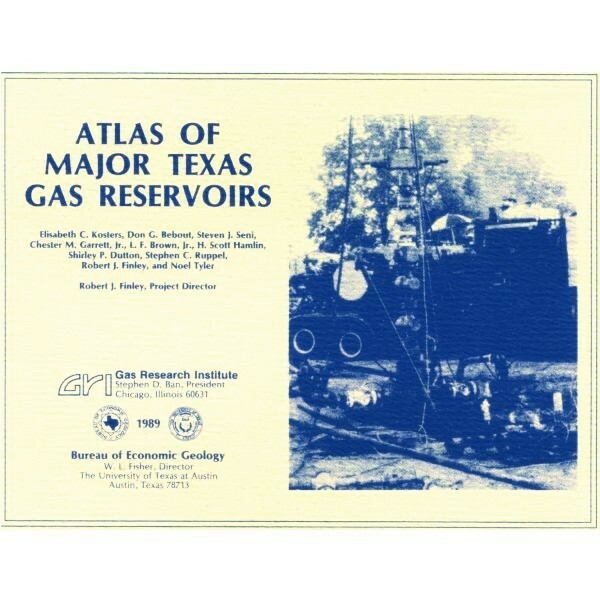 Atlas of Major Texas Gas Reservoirs, by E. C. Kosters and others. Oversize, coil-bound book, 161 p., 459 figs., 77 tables, 4 oversize color plates in back pocket, 1989. To purchase this publication as a PDF download, please order AT0001D. To purchase the Atlas of Major Texas Gas Reservoirs in CD format, please order AT0001CD. This "Atlas of Major Texas Gas Reservoirs" characterizes [major gas] reservoirs, each of which has produced more than 10 billion cubic feet (Bd), according to their geology, volumetrics, and engineering properties. Emphasis has been placed on those 868 reservoirs that have produced more than 30 Bcf. All reservoirs have been classified into 73 geologically similar groups, termed plays, that allow easy comparison of reservoir characteristics and define major producing trends. Ranking of these plays by cumulative production is shown…. Most Texas fields produce hydrocarbons from multiple reservoirs that in many cases vary in lithology (pl. 1), depositional setting (fig. 1, pl. 2), geologic age (fig. 2, pl. 3), diagenesis, porosity and permeability, thickness, lateral distribution, trapping mechanism (pl. 4), drive mechanism, and fluid content. Therefore, we have organized this atlas at the reservoir level and grouped reservoirs into genetically related plays that are based primarily on similarity of reservoir depositional setting (fig. 1, pl. 1). The reservoirs within each play are related geologically and have similar production characteristics; characteristics determined for the major reservoirs included in the atlas can then be extrapolated to volumetrically smaller and lesser-known reservoirs within the same play. The objectives of this atlas are to (1) organize the reservoirs into plays on the basis of depositional setting, trapping style, and shared reservoir parameters, (2) illustrate and describe each play, and (3) relate reservoir engineering and production data to the geological framework. We have attempted only to synthesize existing geological and engineering data and interpretations as they appear in published reports and files open to the public. Few new interpretations are presented here; critical compilation of data and definition of the stratigraphic and structural relationships that led to play delineation are the major contributions. Kosters, E. C., and others, 1989, Atlas of Major Texas Gas Reservoirs: The University of Texas at Austin, Bureau of Economic Geology, Atlas of Major Texas Gas Reservoirs, AT0001, 161 p.